Doug Hobart, as the mad Dr. Salgoud Traboh (which is Doug Hobart spelled backwards). 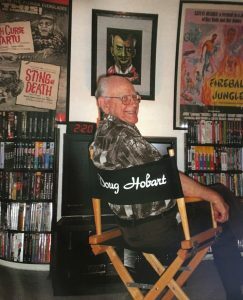 From circus to cinema, Douglas B. Hobart, has had an enviable career in the entertainment industry. He was born May 20, 1927, the same day the famous aviator Charles Lindbergh took off on his historic transatlantic flight to Paris. He literally grew up in the circus as his father was a talented circus musician. His mother’s family ran a bakery and boarding house in Middleton, Ohio where many theatre, circus and vaudeville entertainers would stay. After his close boyhood friend, Frank Hamilton, became a sailor during WWII, Doug was inspired to enlist. The problem was that Doug was only 17 years old and under age. He could only enlist with parental consent and although his father was reluctant, he finally allowed Doug to join the Navy. Doug enlisted in Miami, Florida and during his medical exam, the doctor found he had a hernia. Despite the hernia, they sent him onto Bainbridge, MD for 10 weeks of boot camp. After that, he boarded a troop train headed to Shoemaker, CA. “When I arrived, I was assigned to a destroyer ship and I took my sea bag and went on board. I was given a bunk and was settling in when I heard, “Hobart – front and center. You are to report to the hospital now!” I reported to the hospital, sea bag and all and was told I would have to be operated on for a hernia. I got scared and fainted and woke up in the psychiatric ward. A psychiatrist named Dr. Branch talked to me and told me I was suffering from a nervous disorder. I had several sessions with him, then I got a three-day pass to San Francisco. While I was there, Japan surrendered and the war was over! The city went nuts! Everybody was hugging and kissing everybody. A guy with a liquor store broke his front window and was giving away free bottles of liquor,” recalls Doug. 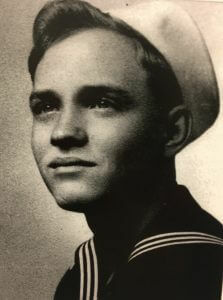 When he returned to his base, he was told that he would be honorably discharged from the Navy on August 17, 1945. He told them he’d rather stay in the Navy but was told that he couldn’t. He had enlisted for the duration of the war and it was finally over. So due to his youth and the timing of the war, Doug never saw combat or left to fight in the Pacific. “Dr. Branch said I would be fine and to keep in touch. 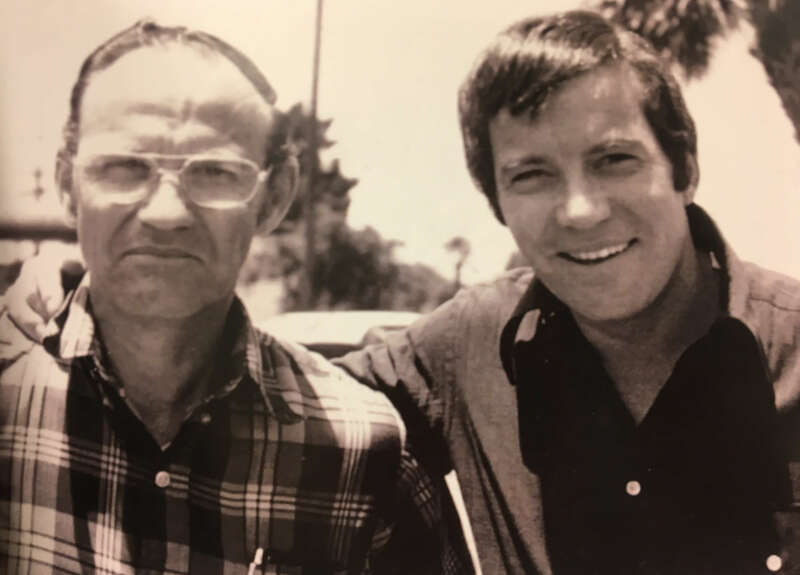 I never did get the hernia repaired until I got home, but I did later write to Dr. Branch,” said Doug. After the war, Doug married Rosemary Henry and had five children: David, Charles, Mary, Robert and Thomas. Without a high school diploma, early on, Doug struggled to find work to support his family. Yet, with his work ethic, ingenuity and creativity, he always managed to find a job or start a business of his own. 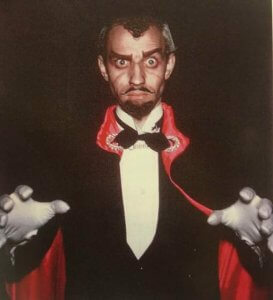 After the war, he combined his talents in special effects, makeup and acting to create and host a "midnight spook show." 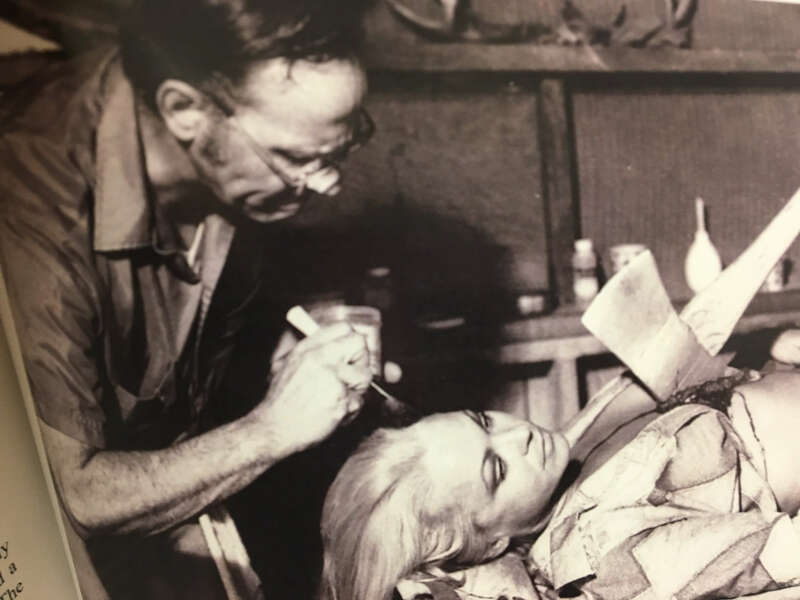 The show, entitled "Dr. Traboh and his chamber of monsters" covered all or parts of Ohio, Kentucky and Indiana and featured a Frankenstein monster, a wolfman, and "five dancing dragonettes.” The local show lasted nine years and ended in the mid-1950's. In films such as “Death Curse of Tartu” and “Sting of Death” some of the monsters Doug portrayed he also created. Doug Hobart, doing make up and special effects for the movie, “Bloodstakers”. In 2015, at age 88 Doug like many seniors, was experiencing problems living independently at home among all his show business memorabilia. He met Stan Wojcik, regional manager at the VetAssist Program. Stan told him that due to his wartime service, he was eligible for military benefits to pay for in-home care. Assistance includes such things as: help with bathing, dressing, meal preparation, light housekeeping, etc. The VetAssist Program is offered coast-to-coast in 44 states across the country to help veterans and their surviving spouses obtain a little-known pension from the Department of Veterans Affairs (VA) with an extra monetary amount for “Aid and Attendance.” The VetAssist Program is for those who choose to use their VA funds primarily for in-home, custodial care or adult day care. Through the VetAssist Program, Doug got help with all the paperwork and VA claims process and in-home care began right away. His home care aide is from Senior Helpers in Florida, one of the contracted home care agencies in the VetAssist Program's provider network. Many wartime veterans like Doug do not realize they qualify. Doug’s story illustrates how combat duty or overseas service is not a requirement for the VA Pension with Aid and Attendance. Find out if the VetAssist Program can help you, please call 888-314-6075 or email us at info@veteranshomecare.com. “You might say that I have had a very ‘entertaining’ life so far,” said Doug who has written, From Circus to Cinema-- An Autobiography. He is now looking for a qualified publisher. We wish Doug continued success in his new endeavors and thank him for sharing his story with our veteran community. Doug Hobart is a U.S. Navy veteran and a veteran of the horror film industry. Here he is at home surrounded by memorabilia from incredible career. Thanks to the VetAssist, Doug receives a VA Pension with Aid and Attendance and in-home care to live safely and independently at his Florida home. Living at home is less scary and more fun for Doug.